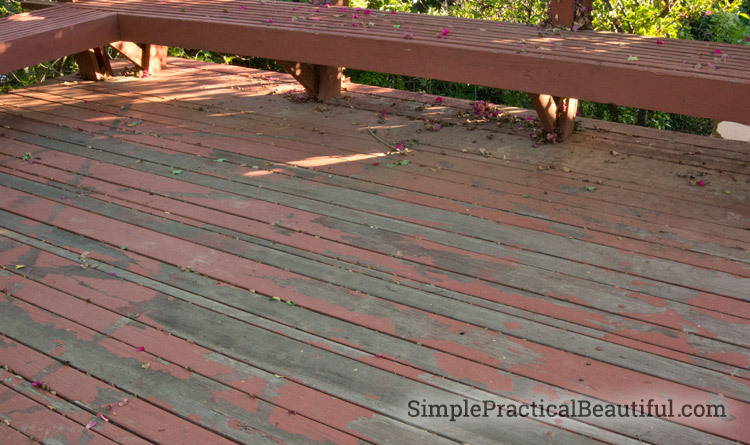 A wood deck that has seen better days can still be restored to a beautiful and functional space. With some hard work and the right supplies, you can make it useful and safe for years to come. Our deck was built long before we moved into this house. It was a well-made deck, and it adds a lot to our backyard, both in square footage and in design. The deck sticks out over a steep slope and turns an otherwise unusable hill into a spacious backyard room. All decks require maintenance, though, and ours was badly neglected and in need of some repair. This post has been a long time coming. 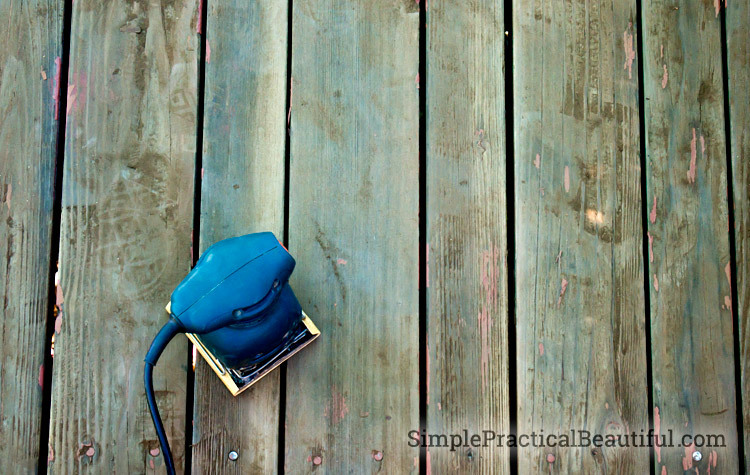 We started refinishing our deck more than a year ago. Late last summer, we decided that the exposed wood and peeling paint needed to be cleaned and protected before any harsh winter weather came. And so we went to work. Our dream for the deck was to strip off all the paint and let the original wood show with only a transparent finish to protect it. 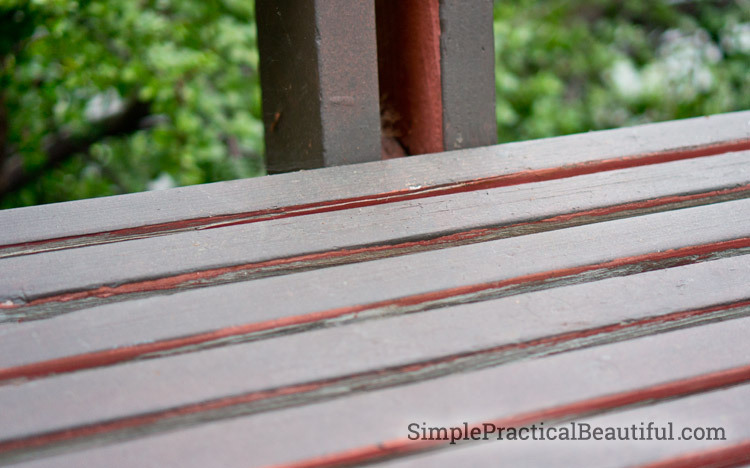 I love wood grain, and when I saw wood peeking through where the paint had peeled off, it gave me hope that this could be a gorgeous wood deck with just a little work. We started removing the paint. First we used a scrub brush and some deck cleaner. It wasn’t enough. So we rented a pressure washer. A pressure washer sprays water at high speeds. A gas or electric motor forces the water out at more than 3000 PSI (pound-force per square inch). 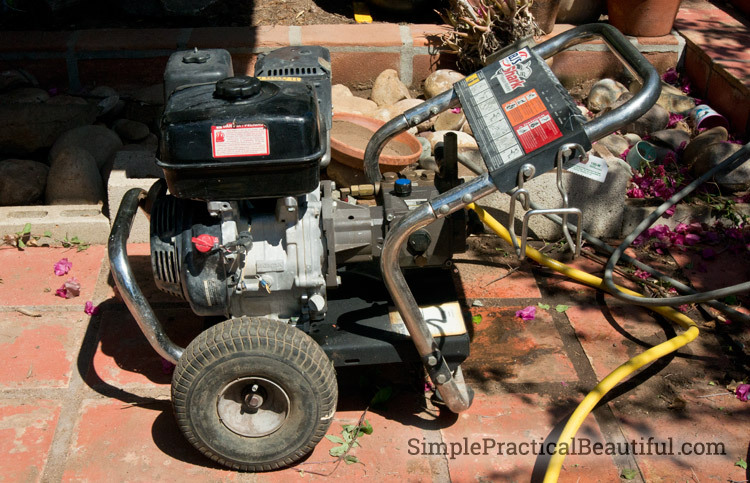 There are many different sizes of pressure washers. The smallest will clean dirt off your car. The largest can etch cement. 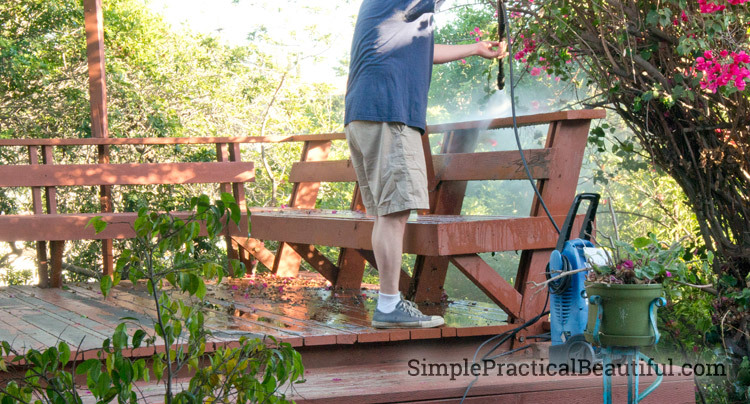 Since we didn’t want to etch the wood of our deck, we rented a pressure washer on the smaller side. It took a few hours to pressure wash the deck and remove most of the paint. It made a mess. Bits of plasticky paint were everywhere. But it was easier than trying to scrub or sand or even chemically remove the old paint from the wood. We had two options: replace all of the floor boards on the deck with new wood or coat the existing boards with something to repair them and keep them strong enough to last for a few more years. That would mean a thick, opaque stain that would cover up the wood. 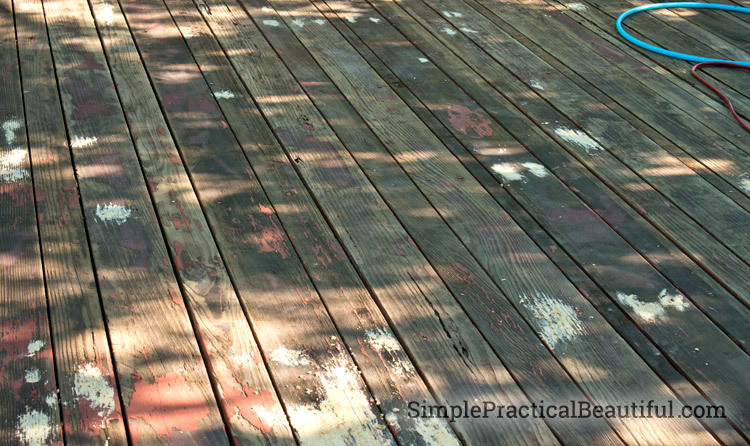 We decided to coat the boards with a deck repair stain because it was the less expensive option. But before we could coat the wood, we had to do some repairs. First, we replaced the six boards that had been damaged by termites. All of the boards on our deck seem to be slightly different widths. I’m not sure why. We had to have the lumberyard custom rip a couple of boards to get them the right width. The existing deck boards had been attached to the frame with nails, which are not as secure as screws. We pulled up all the nails that came out easily (more than half of them) and replaced them with deck screws. We’ll replace the remaining nails as they start to pop up. We filled in the deeper gouges with wood filler. Then I sanded the entire floor of the deck. I only have a little palm sander, but I put in some 80 grit sand paper and went to work. I smoothed out the surface and got rid of loose splinters and jagged edges. Luckily, it didn’t kill my sander. 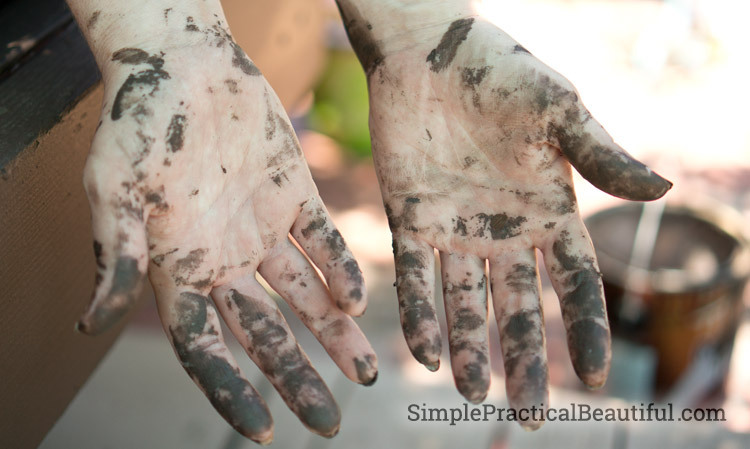 First, you may notice that I use the words stain and paint interchangeably throughout this post. I have yet to find any difference between latex paint and latex-based opaque stain. 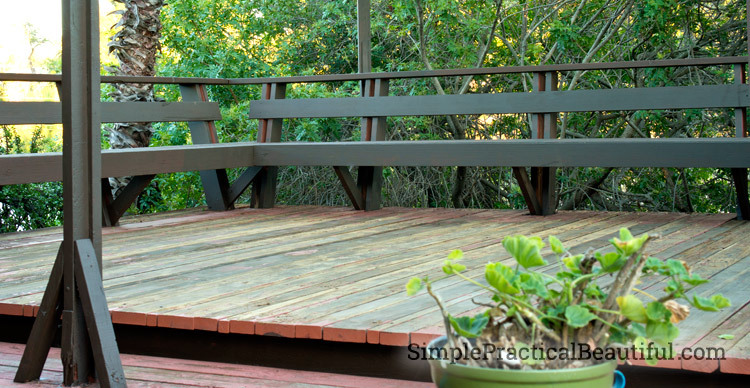 Paint that is made for decks and exterior wood is called stain. 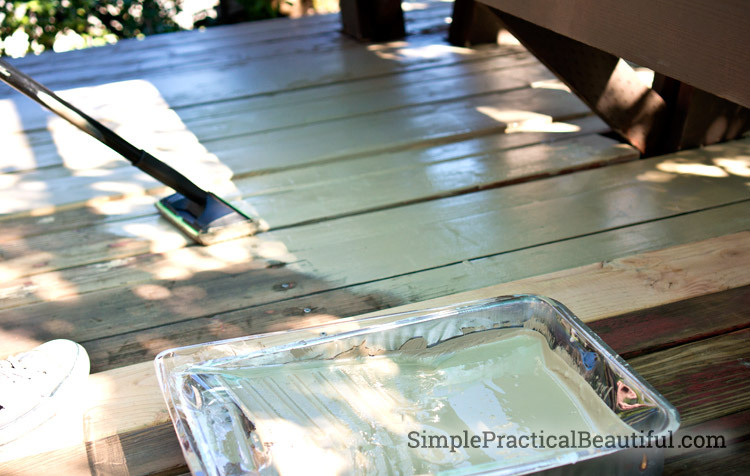 With the surface repaired, it was time to start painting the deck with a stain that could rescue the wood. We found DeckCorrect by Cabot. It goes on really thick and fills in small holes and holds down splinters. Just what our deck needed. We applied the stain with a paint brush and a staining pad on a broom stick. I brushed stain onto the ends of the boards and around all of the joints and in crevices while my husband push stain on with a stain pad, constantly refilling it from a paint tray. It was a lot of work. It took us 2 days total to get that first coat done. Okay, I have to back up for a minute. You’ll notice that the benches are a different color than the deck. Everything I’ve described up until now is about the floor of the deck. The wood on the benches was in better condition and only needed to be stained with a normal deck stain. We chose a dark color so that the benches would be a different color than the floor of the deck and look more like furniture. The dark color also helps them disappear into the trees behind the deck a little. I applied the dark stain with a small roller and a brush. It was a lot of work, and it required some acrobatics to get the back of the benches painted. I’m usually pretty messy when I paint anyway. I was a complete disaster, and very brown, after this project. 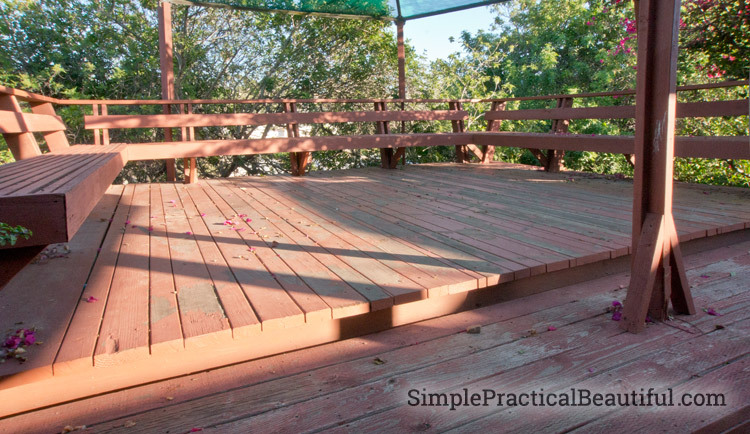 The deck was painted (at least the first coat), and the wood would be protected from our winter rains. We decided it was good enough. At least for the time being. Sadly, while the deck looked much better from far away, up close it looked terrible. 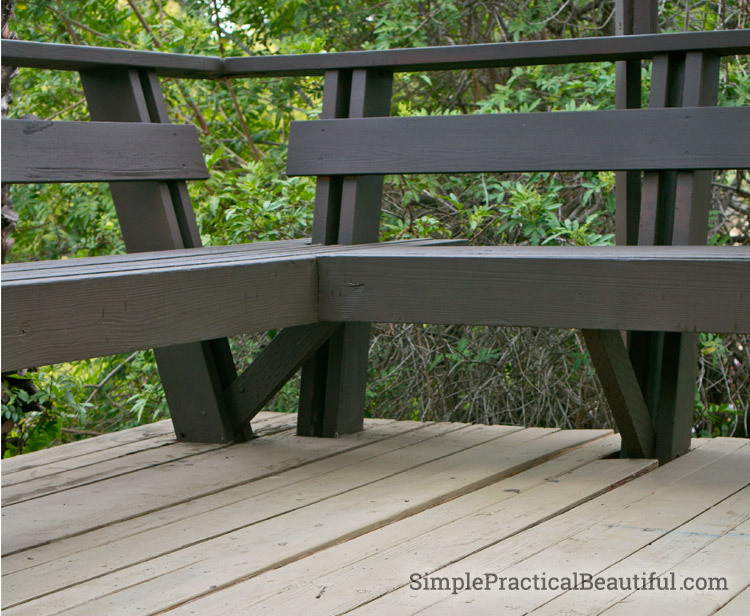 The paint brush, roller, and stain pad could not get between the boards of the deck or the slats of the benches. You’ll notice there are a lot of places on our deck and the benches where two boards are really close together. Lots of tight spaces. The old red paint showed through everywhere and so did a lot of the raw wood. Our tools just weren’t good enough for finishing our deck. We weren’t sure what to use, so we spent the next few (winter) months doing some research. We also weren’t really happy with the color of the deck. It was supposed to be a dark taupe color, but in the glare of the sun it looked white. So we started looking at a new color for the deck floor. 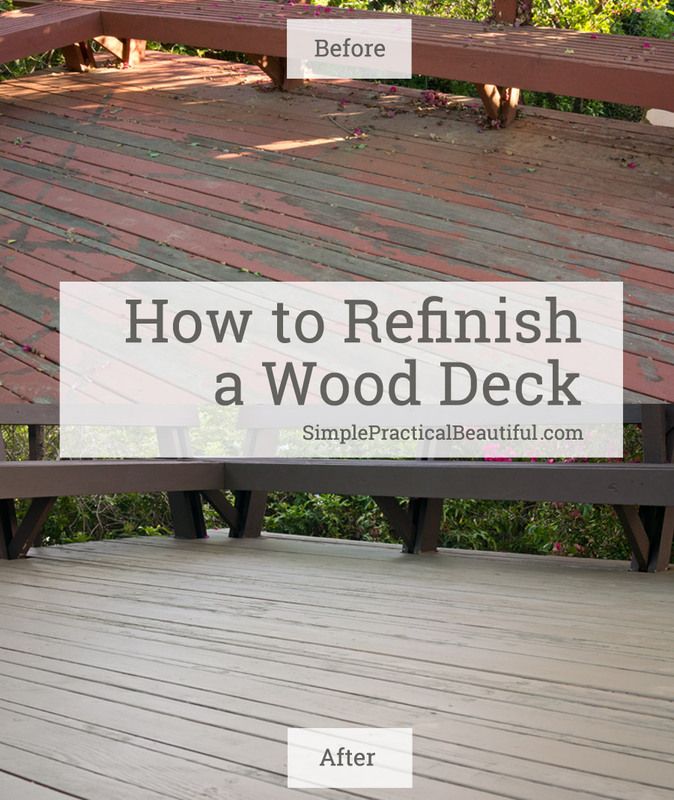 Read the rest of our exciting adventure in Part 2 of refinishing the deck: How to Maintain and Refinish a Wood Deck. Thank you so much, Kati. I love having a deck, mostly because our backyard is small and it gives us more room. 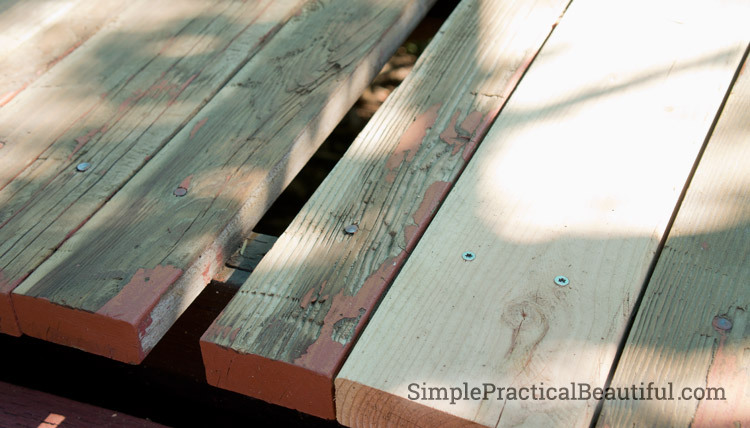 Building a deck would be a lot of work, but after looking at your other projects, I’m sure you could do it! You did an excellent job! I love the color combination you picked out, and great idea using the pressure washer before you started!! Thanks, Steve. The pressure washer was great. And I’m pretty happy with the colors, although I still really wish we could have had the wood show on the floor of the deck. Now I will know what to do next time I’m redoing a deck. Thanks for showing all the details. I’m looking forward to Part 2! Thanks. Part 2 is up! It’s nice to finally be finished with such a big project. The colors you picked are gorgeous! What was the brand and model for the pressure washer? Was it good?